– Corrosion protection of roof coverings. 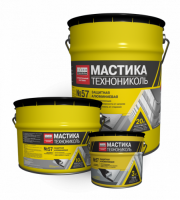 Protective aluminum mastic #57 is a multicomponent material consisting of oil bitumen, modified by polymers, aluminum pigment, technological additives and organic solvent. The elastic insulating cover effectively protects bitumen roofs against UV-radiation and heating, and metal roofs against corrosion. – on metal roof — 0.4 kg/m2. Store in a dry place protected against sunlight at a temperature between –20°C and +30°C. Guaranteed storage period — 12 months.